So many things are given the title of luxury: luxury sedan, luxury cruise, luxury airliner. In my world, luxury usually means unaffordable and unattainable. But the Lady of Luxury crochet infinity scarf is delightfully luxurious and it’s made with a Red Heart Yarn so you know it’s affordable! In this case, luxury doesn’t mean complicated either! 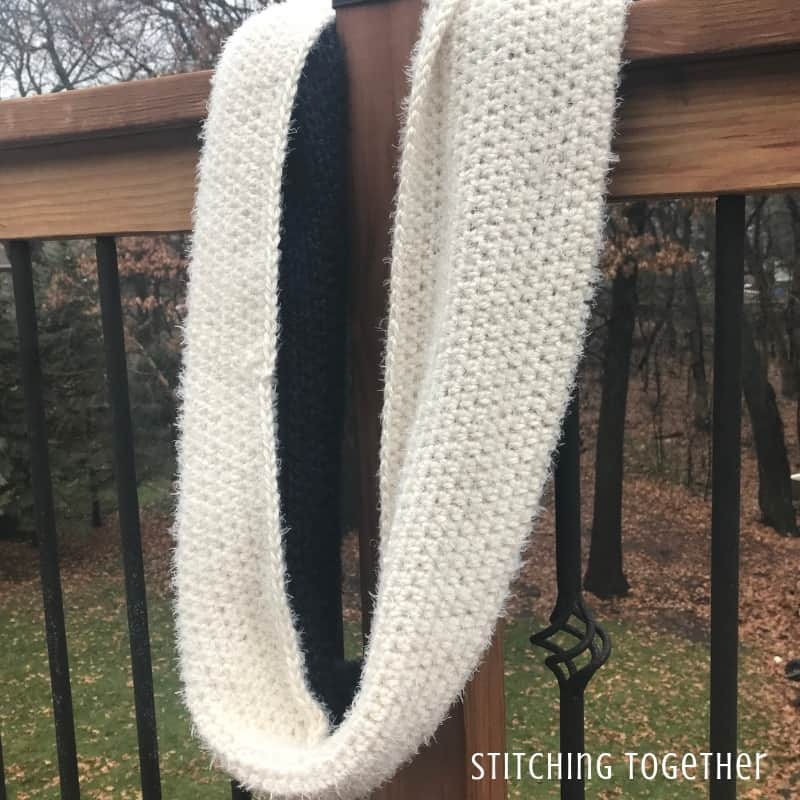 The entire scarf is worked using half double crochets, so it is great even for beginners. You’ll need to know how to chain, join with a slip stitch, and half double crochet. 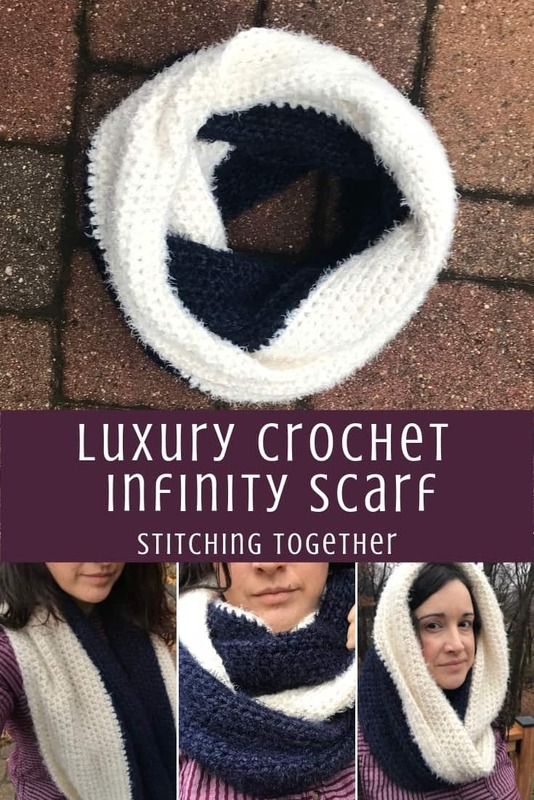 This crochet infinity scarf is wonderfully oversized and designed to wrap around your neck two times. It is WARM; not the kind of scarf you’ll keep on indoors, but the kind that will keep the chill away as the cold winter wind whips around you. Perhaps you see those little fuzzy bits on the Hygge yarn and just know that this yarn is going to be a pain to work with. 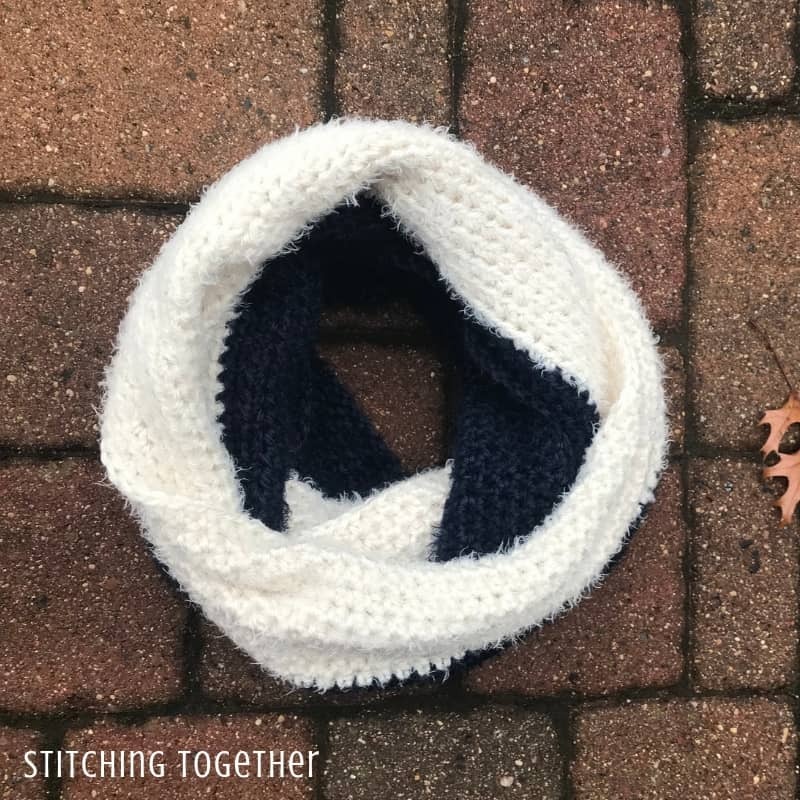 You are ready to skip on to the next pattern because there is no way you are going to get stuck making a scarf with terrible yarn. But wait until you feel it. Getting your hands on this yarn will change your mind! This Hygge yarn embodies the concepts of coziness and comfort. It is soft, not scratchy, smooth not rough. The fuzzy parts are short and work with the yarn instead of against it! Surprisingly enough, it is incredibly easy to crochet with. While it feels light and bouncy, The yarn, once worked up is actually a bit heavy. You’ll feel like you are getting gently hugged with this luxurious scarf sitting on your shoulders. If you want to only purchase two of the 8 oz skeins, you will just have a narrower scarf. Each color block will be around 13 rows instead of 17 rows and a total of 26 rows for the scarf instead of 34. 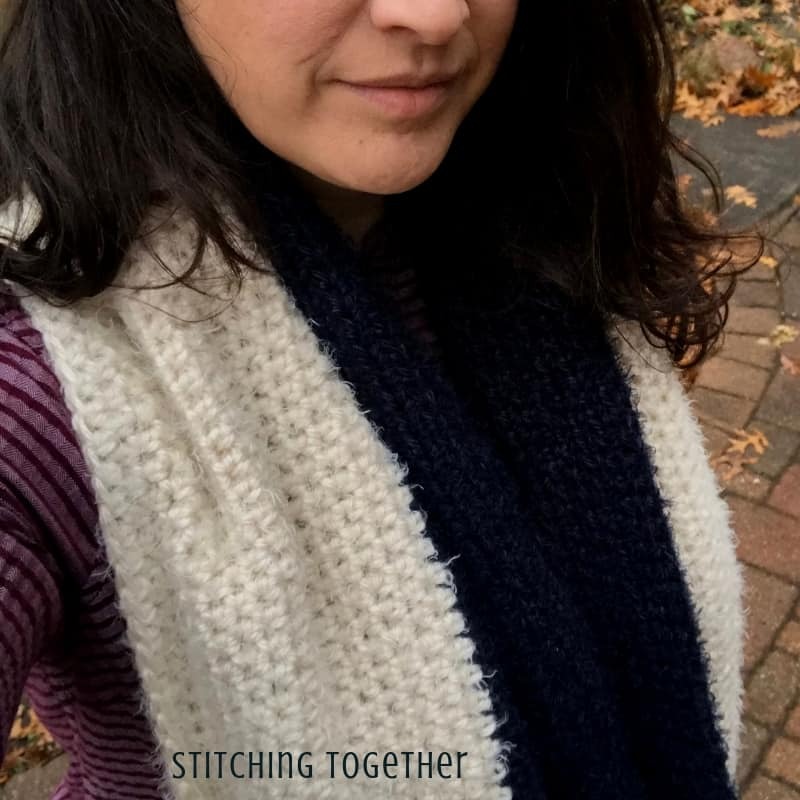 You’ll have an approximately 12″ wide scarf which is still oversized! 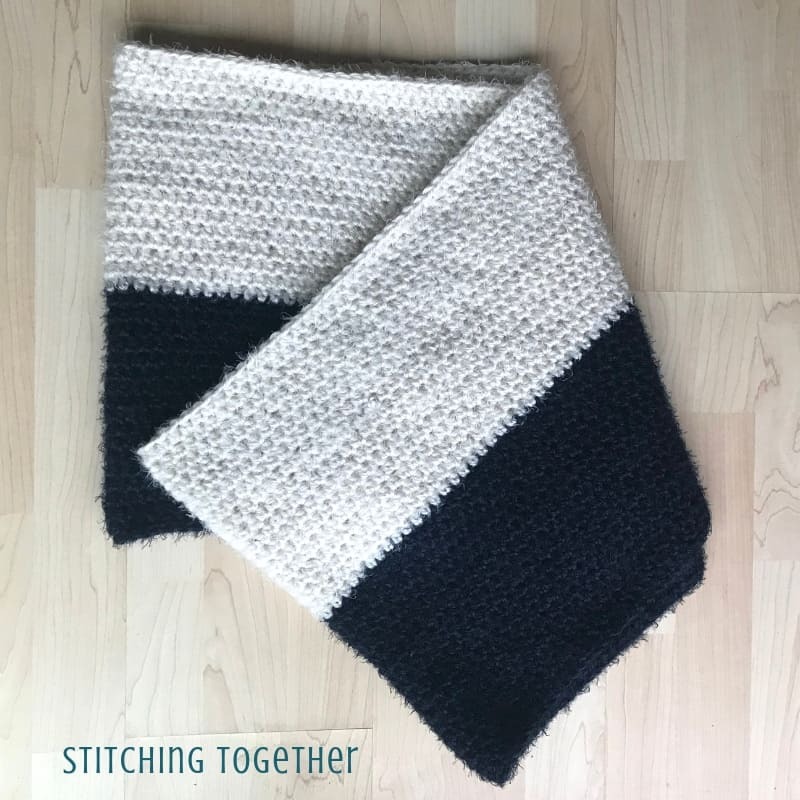 Gauge is not critical for this project, but your finished size, especially the number of rows you can make, may be different. Work with your first color until the last round you can complete with it. You will have plenty to do the same number of rows in the contrasting color since the first color also used yarn for the chain. Ch 147 with indigo, join with a sl st to form a circle being sure not to twist the chain. R1: ch 1, hdc in each ch, join with a sl st to the first hdc of the round. R2: ch 1, hdc in each st, join with sl st to the first hdc of the round. Ready to Get Started? Grab you Supplies Now! 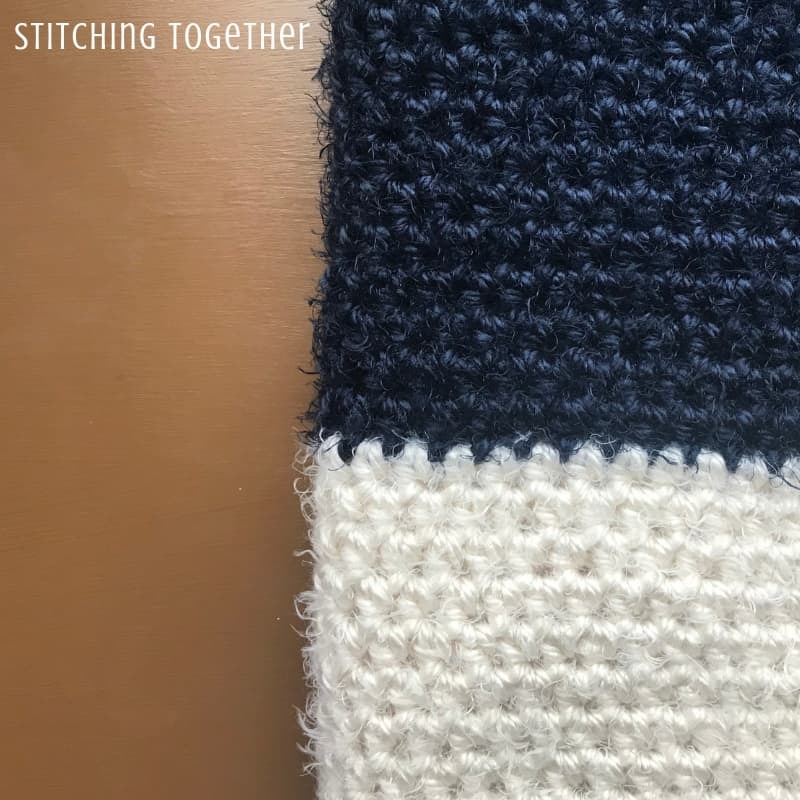 Share your work in the Stitching Together Community. Please enjoy the patterns provided here but do not reproduce them or represent them as your own. Feel free to sell anything you make using one of my patterns. When possible link back to my blog or give credit for the pattern. You may not claim my patterns as your own or sell them. 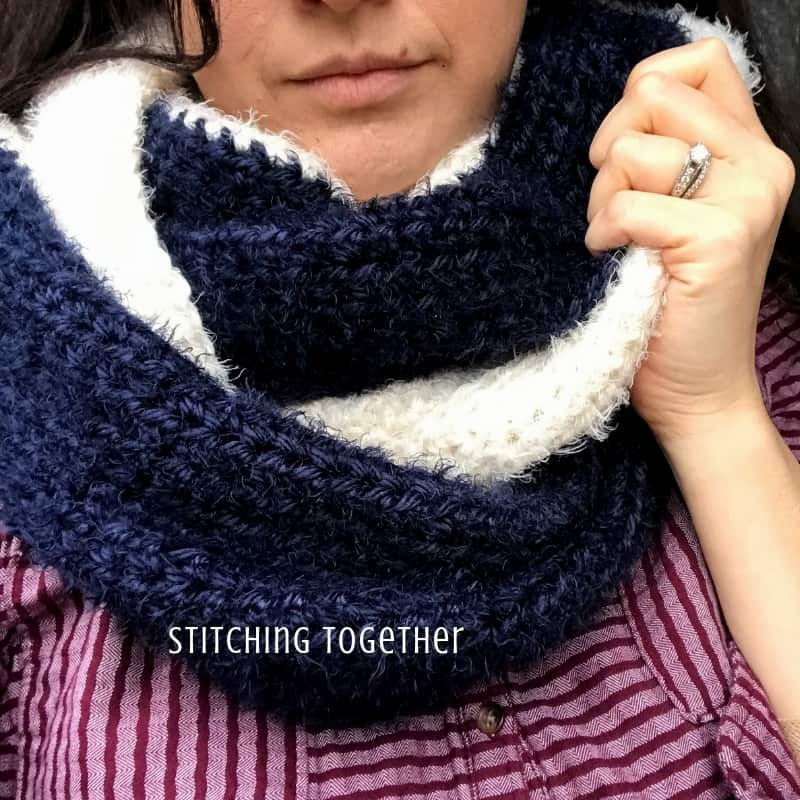 If you share a pattern on social media, please provide a link directly to the pattern post on my blog. Stitching Together is a participant in the Amazon EU Associates Programme, an affiliate advertising programme designed to provide a means for sites to earn advertising fees by advertising and linking to Amazon.co.uk.